An Irish property fund specialising in high-street shopping opportunities has acquired a second retail portfolio in Dublin’s south inner city only 18 months after assembling another retail pitch on Nassau and Dawson streets. 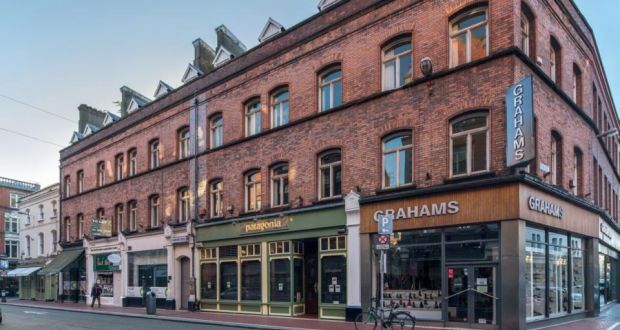 BCP Asset Management paid €11.33 million on behalf of its international fund for St Andrew’s House, a four-storey-over-basement Victorian block with five shops fronting on to Exchequer Street and two more on South William Street. The investment is located 200m west of Grafton Street and includes shops operated by Patagonia, Skinfull Affairs and Graham Shoes. The sale includes the full frontage of Exchequer Street from Drury Street to South William Street (Nos 22-34), with the exception of the French patisserie Ladurée on the corner, along with Nos 4 and 5 South William Street. The 1,446sq m (15,566sq ft) block has 520sq m (5,602sq ft) of retail space, 645sq m (6,941sq ft) of offices and three apartments. Fiona Kennedy of CBRE, who handled the sale, initially quoted €8.3 million for the investment, sold at the request of receivers to Clydeswell Investments Ltd, whose shareholders include solicitor Paul Hanby. BCP was advised by Dessie Kilkenny of Savills. The mixed-use portfolio has an 80 per cent occupancy rate and will show an initial return 4.3 per cent, according to CBRE. The rent roll of €532,000 is expected to rise to at least €680,000 when a vacant shop is let at €75,000 per annum and tenants are found for unused office space. The highest rent – €146,000 – is paid by Grahams Shoes, which sublets a large part of its premises to Patagonia at more than €100,000 per annum. BCP’s Nick Cullen said St Andrew’s House fits well with the company’s existing strategy of acquiring commercial property in prime retail locations in Dublin city centre with the potential for “value-accretive asset-management projects”. In addition to a significant rental growth opportunity, St Andrew’s House would provide a cash yield of 7.7 per cent for their fund after prudent and conservative gearing. BCP’s international fund and London investors Meyer Bergman have acquired 14 shops along Nassau and Dawson streets with the intention of making them available for Grafton Street-style shopping. International fashion retailers have found it increasingly difficult to rent large-scale stores at reasonable rents on Grafton Street or adjoining streets has gross assets under management of €35.6 million, with a loan to value of 29.5 per cent.